Electrical engineer with twenty years demonstrated success in a product development environment specifying, designing, and testing radar, radio and wireless communications hardware. Electronics technician for eleven years prior to earning a BSEE. Experienced in detailed design, prototype fabrication, testing, and documentation of RF and analog circuit boards and connectorized components. Some digital and PLD design. Familiar with many software packages. Beginning with my first assignment out of college performing system design for an airborne L-Band receiver, I have purposed to increase my knowledge of system requirements and understand the effects and limitations that realizable components impose on the system. I have combined creation of personal software and usage of commercial software to gain an understanding of internal and external effects on performance, and to compare those predictions with actual prototype models built in the laboratory. A combination of extensive research into known phenomena, conducting tests to determine real-life performance and tapping the experienced engineers is utilized throughout the initial specification, design and implementation phases. Lessons learned are fed back into the models to make future predictions more accurate. Having participated in design teams for airborne and ground-based radar, military communications, and commercial satellite earth station systems, I have a very good appreciation for the great number of factors that can - and do - affect system performance. Many printed circuit board designs have been completed, ranging from simple power supply filters to multi-layered, mixed signal digital/RF modems. Most of my work entails analog and RF circuits up through about 1 GHz, with a small amount of digital support circuitry. Opamps, lumped element passive and active filters, DAC's/ADC's, switches, couplers, control & monitoring, and power supplies are among successfully implemented designs. A good understanding of component and circuit trace coupling has resulted in very few second or third iterations of PCB's due to crosstalk or interference issues. I have supervised the PCB layout process for many complex PCB's that included controlled impedance layers, analog/digital power and ground separation, RFI/EMI shielding and high density, double-sided configurations. Software simulation primarily included use of MicroSim and Touchstone, with various other packages used for minor features (e.g., active filter design). With frequencies above 1 GHz, connectorized components with coax interconnects have been the rule. Some waveguide work has been performed in the S-, C-, X- and Ka-bands. These circuits have usually been part of a baseband-to-microwave conversion chain, so the total system requirements were included in the component selection and interface plan. For every project on which I have worked, writing in the form of system performance specifications, electrical test procedures, production assembly procedures, system reference documents and proposal generation has been an integral part. Daily maintenance of the RF Cafe web site and correspondence with site visitors often requires application of sound technical writing skills. A couple published articles in trade magazines and very extensive user's manuals for my software are included as well. Finally, I have performed a couple pre-publication technical book reviews for a publisher. Beginning with proposals and culminating with presentations to the customer for design reviews and visits to customer sites for installation assistance, my experiences have been very satisfactory. At times, frequent telephone and face-to-face meetings were necessary to assure customer expectations were met. Although I enjoy working directly with customers, my preference is to remain in the plant and avoid travel altogether. My borrowed motto is, "If it hasn't been tested, it doesn't work." No amount of simulation and planning can suffice to declare a design working without testing over all planned operational conditions. Accordingly, much of my time as an engineer has been spent in a lab environment building, tuning and measuring circuits and systems. Test equipment familiarity is listed below. Ability to enter new situations and quickly come up to speed on requirements, then propose and implement solutions. I have successfully worked both alone and in design teams. As part of my RF Cafe effort, I consistently review many industry news events and vendor products to keep current on the latest innovations. I prefer not to take on project management roles, preferring rather to be an individual contributor and concentrate on technical aspects of projects. Being required travel for anything other than seminars or classes causes me to look for new jobs. Designed turn-key production test solutions for wireless base station and wireless appliance products in the GSM, DCS, PCS and iDEN™ bands. Generated electrical engineering portion of test system proposals, including concept definition, cost estimate, labor schedule and customer interface. Test fixture and system interface design for high volume production environments, including pin probing of circuit boards and design of over-the-air antenna RF couplers. Performed passive intermodulation (PIM) testing on high power base station components. Supported design and integration effort on VHF radio multi-port cosite interference cancellation system. Designed UHF amplifier/filter printed circuit assembly. Designed and tested VHF switch matrix and amplifier PCA. Perform system design and analysis on C-, X-, and Ku-Band satellite earth station systems. Create production assembly drawings and parts lists. Performed preliminary RF/analog design and analysis of transmitter/receiver chains on S-Band mobile radar system proposal. Specified, designed, analyzed, ordered parts for, directed building of, documented, tested and integrated RF/analog transmit/receive chain of Multi-Purpose Airport Radar (MPAR) IR&D project. S-Band through baseband up/down conversion using combination of coaxial and waveguide components was accomplished. Interfaces to digital controller circuits included LVDS, RS-422 and relay implementations. High speed PIN switches and attenuators; low noise amplifiers; high precision, low noise opamp circuits; and precision A/D converters were used. Provided technical support to field engineering effort responsible for initial testing and verification of active element phased array antenna. Planned and implemented physical integration of radar system areas at local and open air test sites. Designed and directed building of digital processing equipment rack and RF/Analog equipment rack, including interface cabling. Initiated and designed Intranet web site for RF/Analog Design Engineering unit. Maintained CAE software tool upgrades and performed user support. Performed analysis and designed front end for UHF/L-Band, 4-channel, direction-finding (DF) airborne receiving system including BIT circuitry. Combination of connectorized and discrete components employed in implementation of two chassis assemblies and an 8-layer, surface-mount PCB. Designed S/C-Band multi-octave front end for 8-channel DF system. Completed project planning and design of test station to support depot maintenance on a tracking and ranging S-Band receiver employed in the Air Force Satellite Control Network (for AlliedSignal Technical Services Co.). Design of 10 MHz distribution unit, S-Band AM modulator, and creation of an overall testing philosophy were my primary responsibilities. Founded Waypoint Software in 1992 to market TxRx Designer software. Conceived of and wrote TxRx Designer software (all versions) in Turbo Pascal. Wrote and published user’s manual. Owner of all copyrights. TxRx Designer is a full-featured frequency conversion and cascade analysis CAE package with a custom graphical user interface. Created and implemented marketing plan for advertisement in worldwide RF engineering journals. Instituted customer response and order processing system. Conceived of and wrote EE Ref software in Turbo C++ for Windows. Owner of all copyrights. Lead engineer for the redesign of a van-based mobile interrogation system used in automated utility meter reading (910 - 960 MHz). Performed system analysis for transmit and receive subsystems. Eliminated long-standing modulation-induced spurious output from transmitter while increasing output power. Designed new low noise front end for downconverter. Specified higher performance Tx/Rx duplexer. Modified receiver cards to improve bandwidth and detector response. Wrote and performed extensive system test and production test procedures. Very successful program. Served as Design Engineering interface to Manufacturing for production related issues on van-based and handheld units. Designated test equipment for automated testing in newly formed Engineering Test group. Responsible for RF and analog design of a Single-Channel-Per-Carrier earth station modem for the Inmarsat satellite system. Incorporated an O-QPSK/BPSK modulator/demodulator for translation of baseband voice/fax/data information to a 70 MHz IF within a dense, multi-layer surface-mount board. Active and passive filters, A/D, D/A, RF amplifiers, PIN attenuators, power splitters/combiners, mixers, and a digital output power level setting with digital leveling loop were employed. Designed monitor/control ELPD. Wrote interface and test software. Thoroughly documented design and production test procedures. Designed and implemented frequency extension into existing analog transmitter and receiver for Inmarsat M/B system. Performed detailed design verification tests and wrote automated test software for production. Specified and designed rack-mounted C-Band upconverters and downconverters to Inmarsat specifications. Integrated RF subsystem, SBC, custom interface PCB, and local/remote user interface. Performed system analysis and hardware testing. Created documentation for moving into production phase. 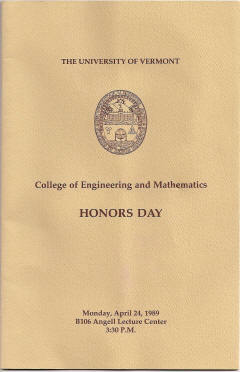 Participated in proposal writing on numerous frequency conversion systems. Designed Supervisory Control And Data Acquisition (SCADA) installations for electrical substations. Introduced volume production techniques to facilitate large-scale SCADA installation effort. Prepared test documentation and trained test technicians. Worked with engineering team to design programmable, multi-channel airborne L-Band downconverter. Designed and documented hardware packaging and substrates for hybrid RF, digital, and analog circuits. Performed system cascade analysis of RF conversion path using OmniSys and custom spreadsheet. Spectrum analyzer, oscilloscope, frequency counter, power meter, SINAD meter, frequency synthesizer, signal generator, DMM, gain/phase meter, I/Q test set, network analyzer, logic analyzer, arbitrary waveform generator, VSWR meter, noise figure meter, audio analyzer, modulation analyzer, passive intermodulation (PIM) analyzer (including GPIB interface to many). RF Workbench, OmniSys, Touchstone, ADS, OrCad, Altera, MicroSim Spice, MicroCap, MicroLogic, AutoCad, Visio. 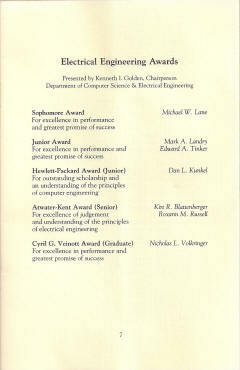 Atwater Kent Engineering Excellence Award, University of Vermont, 1989. RF Design Software Contest, RF Design, 1992 (article in 11/92 edition). As a lifelong aviation enthusiast, I spend as much time as possible building and flying model aircraft of all types, including radio control ,free flight and control line (wwwAirplanesAndRockets.com). Amateur astronomy, while a major pastime during my Air Force years, is now a secondary hobby limited to monthly reading of magazines. Amateur radio is a relatively recent pastime as well. Computer programming and website design manage to take a large portion of my "free" time. Here is my certificate for completing a National Radio Institute (NRI) electronics technician course. 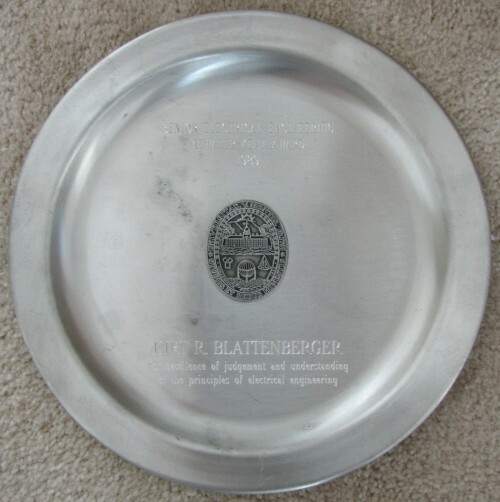 This is a photo of the Atwater-Kent Award that was presented to me upon my graduation in 1989 from the University of Vermont.